Recommended for initial scuff and wear protection in re-assembly and repair of two- and four cycle engines, as well as cycle transmissions. 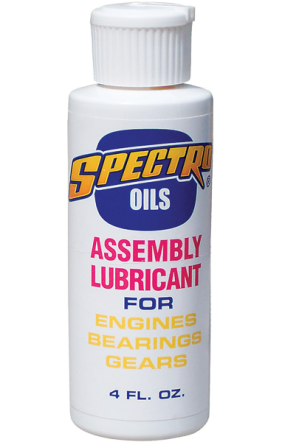 A heavy weight lubricant fortified with anti-scuff polymers, Spectro Assembly Lubricant can be applied to rings, cam lobes, gears and bearings — and it coats and plates them completely, assuring total starting protection. Compatible with all Spectro lubricants and other petroleum-based products, Assembly Lubricant provides anti-rust properties for prolonged storage of engine and transmission parts.